"It needs special care to eradicate it," a doctor says. The Pentagon said today dozens of laboratories across the country may have inadvertently received live anthrax, though at no risk to the public's health. But the disclosure highlights the question: Why didn't the Department of Defense lab technicians' gamma rays kill the spores before they were shipped? Dr. Pritish Tosh, formerly of the CDC who is a physician of infectious disease at Mayo Clinic and member of Mayo's vaccine research group, said most people think of anthrax as a biological weapon, but it's a naturally occurring infection. "Because it’s a spore-forming organism, it needs special care to eradicate it," Tosh said. (Jim Urquhart/AP Photo) A Jan. 27, 2010 file photo shows the main gate at Dugway Proving Ground military base, about 85 miles southwest of Salt Lake City, Utah. 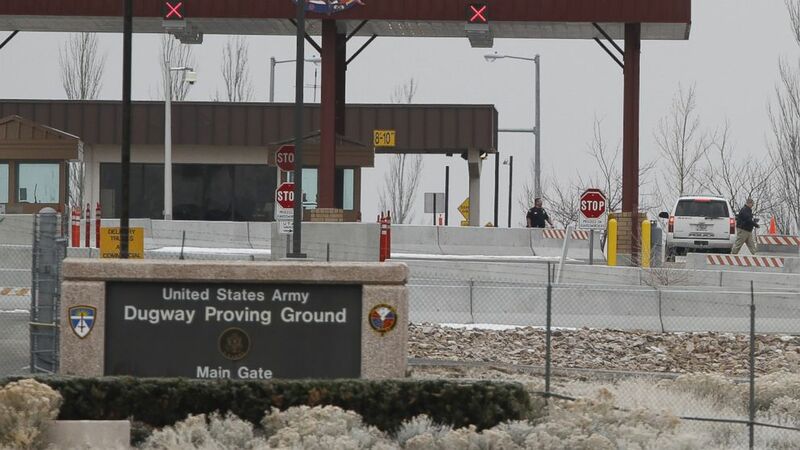 A Pentagon spokesman said suspected live anthrax samples were shipped from Dugway Proving Ground using a commercial delivery service. John Clements, Tulane University School of Medicine professor and chair of the school's Department of Microbiology and Immunology, said spores can stay in the environment for 100 years or more. Clements likens it to a plant seed. "They’re stable until you put them in fertile ground and give them some nutrients," he said. "In this case the fertile ground is mammalian tissues. If that fertile ground is a cut in your skin you get cutaneous anthrax. If that fertile ground is your lung, you get inhalational anthrax." Stephen S. Morse, professor of epidemiology at Columbia University's Mailman School of Public Health, said anthrax spores have multiple layers of protection. "It’s kind of like being in the middle of an onion," Morse said, including a hirsute nap, exosporium, spore coat and cortex that surround the "core" that will germinate, or "grow up," under suitable conditions. But Morse said there are a number of ways to kill anthrax spores, including irradiation and chlorine compounds, when applied "vigorously and for a long enough time." "They’re among the hardiest of conventional organisms," Morse said.